Drive Only remain open until 9th April. 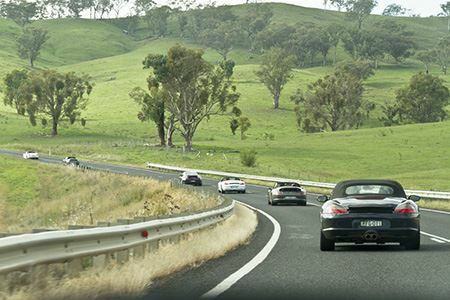 For those PCNSW Members who enjoy taking their Porsches on long drives along some of the best country roads in NSW. Approximately 800kms over two days or 1300km over 3 days if you can take Monday off work. Saturday 9 April Windsor to Parklands Resort, Mudgee via the Putty Road & Denman – 380km. Saturday Evening – Chauffeur driven bus to & from Lowe Winery ( www.lowewine.com.au) for sumptuous dinner of shared platters of food . Cost: $75/ person including drive, bus & dinner. Lowe wines will be able to be purchased by the bottle at the cellar door to drink with your dinner or to take home at your own additional cost. Sunday evening – get together at The Vines Restaurant & Bar at Parklands Resort at your own expense. Monday (for those lucky enough not to have to be at work) return to Sydney via Oberon-Taralga-Goulburn – 500km. IT WAS PROPOSED THAT THAT WE ALL STAY AT THE PARKLANDS RESORT & CONFERENCE CENTRE, MUDGEE FOR THE SATURDAY & SUNDAY EVENINGS. HOWEVER IT IS ALREADY FULLY BOOKED SO YOU WILL NEED TO DO YOUR OWN BOOKINGS AT WHATEVER ACCOMMODATION YOU CAN FIND IN AND AROUND MUDGEE. IT IS RECOMMENDED YOU DO THIS NOW AS MUDGEE IS A POPULAR WEEKEND DESTINATION. Some alternative accommodation places already booked by members doing this event are the ‘Winning Post Motel’, ‘Comfort Inn’ and the ‘Big 4 Caravan Park’. There are a number of other alternatives if you look on internet searches such as ‘Mudgee Accommodation’, ‘TripAdvisor’, ‘Whatif’ etc. ON SATURDAY EVENING A BUS TO PICK UP AND DROP OFF HAS BEEN ARRANGED AT THE VARIOUS ACCOMMODATION PLACES AROUND MUDGEE TO TAKE US TO AND FROM THE DINNER AT LOWE WINERY. BEFORE YOU REGISTER FOR THIS EVENT PLEASE ENSURE YOU HAVE CONFIRMED ACCOMMODATION IN OR NEAR MUDGEE FOR THIS BIG DRIVE WEEKEND.